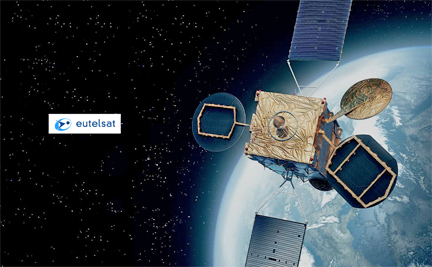 [SatNews] Airbus Defence and Space is awarded a contract by Eutelsat to design and build a highly innovative, high-performance (hosting a C-, a Ku-band and a high throughput payload) telecommunications satellite. The new satellite will be launched in first half 2017, making it the first European satellite to demonstrate electric propulsion for orbit raising. EUTELSAT 172B is based on the Eurostar E3000 platform from Airbus Defence and Space, representing its latest evolution EOR (Electric Orbit Raising). This version uses only electric propulsion for initial orbit raising and all on-orbit maneuvers. The reduction in mass enables the satellite to be launched with the Ariane 5 lower position, offering lower launch costs. In-orbit raising is expected to take approximately four months. The satellite will have electric power of 13kW, with a launch weight of 3,500kg. 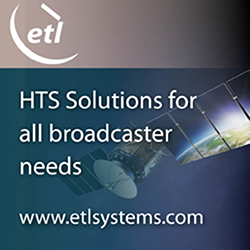 The satellite also incorporates other state-of-the-art solutions, such as the flexibility to dynamically distribute power between the set of beams connected to its high throughput payload. A regular Ku-band payload of 36 physical transponders that will more than double capacity at 172 degrees East. Transponders will be connected to five improved service areas: North Pacific, North East Asia, South East Pacific, South West Pacific and South Pacific. A high throughput Ku-band payload specifically designed for in-flight broadband, featuring multiple user spots optimized to serve densely-used Asian and trans-Pacific flight paths and interconnected to gateways operating in the Ka band. This new payload will be the first customized for in-flight connectivity over the Pacific Ocean Region, delivering an overall throughput of 1.8 Gbps to an underserved market forecast to enjoy sustained growth over the coming years. Additionally, Arianespace has been selected by Eutelsat to launch the 172B satellite, whose multibeam payload will cover the Asia-Pacific region and is designed to support in-flight connectivity services aboard airliners. This new payload will be the first in the Asia-Pacific region designed specially to deliver connectivity onboard aircraft. The Eutelsat 172B satellite will be launched by an Ariane 5 in 2017 from the Guiana Space Center in Kourou, French Guiana. This will be the 28th satellite lofted into orbit by Arianespace for Eutelsat. EUTELSAT 172B will carry three separate payloads: a C-band payload, a Ku-band payload to cover five high-performance zones (North Pacific, Northeast Asia, Southeast Pacific and South Pacific) and an innovative multibeam Ku-band payload designed specifically to support broadband in-flight services.